Square Broach gages (or gauges) can be used to make sure that the size of the square hole has been machined properly. Unlike rotary broaches, square broach gages have no taper. Our square gages are held to tight tolerances and can be made to custom shapes and sizes. Polygon’s square broach gages are made as GO and NOGO pairs. Each gauge is designed to be held by hand and inserted into the square hole. If the NOGO gage fits, then the hole is too large and the part fails inspection. If the GO gage fits, then the hole is the right size and the part will pass inspection. If the hole was too small the GO gage would not have fit inside. Square Gages can also help to determine if there is too much twist in the form, a common troubleshooting feature of holes manufactured using the rotary broaching process. Our Square Broach gages are made of durable hardened M-2 tool steel. 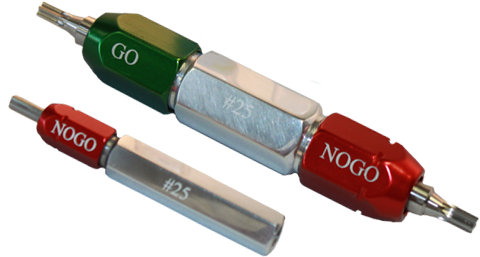 All gages come with handles featuring green caps on the GO gage side and red caps on the NOGO side. Gage Tolerances are +0/-.0002.